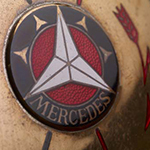 When Daimler Motoren Gesellshaft and Benz & Cie. chose to merge during Germany's post-World War I depression, no one could have foretold the extraordinary influence this company would have upon the automotive community. By 1928, with the engineering talents of Dr. Ferdinand Porsche adding to the earlier accomplishments of Paul Daimler and others, the supercharged S (Sport) Type was the leading edge of a new breed of high-performance luxury automobiles. The solidly mounted 6.8 liter engine provided broad and ample torque as well as contributing greatly to the stability of the chassis. The result was a powerful car suitable for sporting events or touring. In France, Jacques Saoutchik was already making a name for himself as an independent minded quality coach-builder for the worthy and the wealthy from around the globe. A 1928 sales brochure illustrates 3 different body styles for the 680S chassis alone. It is reported that Saoutchik made 12 Torpedo Roadster bodies, all differing in details such as windshield height. This 680S was ordered with a custom Saoutchik Torpedo Roadster body by one Charles Levine but, for reasons thought to be 'business reversals' just prior to the market crash, the customer refused to take delivery when it arrived in New York. Shown at the 1929 New York Auto Show, it must have made quite an impression with its long hood, low windshield, red lizard-skin interior, and 'German silver' fender trim. Maybe it was too avant-garde, as it remained in the Mercedes-Benz dealer's showroom until sold to Mr. Frederick Bedford Jr. of Connecticut. This spectacular car had a major role in the courtship of his future wife, and continued to be a treasured part of their family. In 1980 Mrs. Bedford contracted to have the car restored, unfortunately losing the lizard-skin upholstery and the wheel discs in the process. The car spent the next two decades on display at the Owls Head Museum in Maine, before being sold at auction in 2005. It was on behalf of new owners in 2010 that we undertook the complete body-off restoration of this Mercedes-Benz 680S with its striking Saoutchik coachwork. Their directive was to perform a thorough and authentic restoration, to be ready for touring as well as for concours events. Fortunately, Paul Russell had the opportunity to view and photograph the car in the Bedford garage before the 1980s restoration. These photos, notably of the lizard-skin seats, were just the beginning of the extensive worldwide research required to produce a car deserving the title Best of Show. One of the most important authenticity decisions centered on the car's visuals. Though clearly a pale yellow before the Bedford restoration in the 1980s, the Saoutchik commission records refer to this car as 'Dove Gray'. Without written records explaining this color change and after much consideration, the decision was made to return the car to the as-commissioned color scheme of gray with dark red accents and chassis. The lizard-skin interior involved a few challenges, the first being to find a source for the skins (in southeast Asia, as it turned out), and then to process them in the proper trim color, before cutting them into the individual sections that were sewn together to make the seat panels. The restoration of the fender trim presented a technical challenge. Previously repaired areas were a poor color match. Analysis of the original 'German silver' trim indicated that it was a precise 80/20 copper-nickel alloy, rarely available today. All of the trim was removed, repaired or sectioned in, and resoldered in place. The car was still very complete when it arrived at our shop in 2010, even after years of use and its earlier restoration. The only items missing from the car were the metal covers over the wire wheels and the split front bumper, both of which we were able to fabricate after studying period photographs. The stunning results and thorough preparation inspired the Pebble Beach Concours class judges to award the car the ultimate recognition of 100 points. From there, Jacques Saoutchik's elegant and stylish design elicited the Best of Show award. This magnificent 680S was further honored with the 2012 Restoration of the Year from the International Historic Motoring Awards.